All RAS-D2 Radiator Packs comprise of a RA-FS 15mm bi-directional valve, matching lockshield and a RAS-D2 high performance liquid sensor. All chrome model to compliment designer radiators and towel rails. 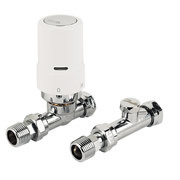 The RAS-D2 radiator thermostats are the latest addition to the Danfoss TRV range. Includes RAS-D2 sensor, RA-FS 15 mm bi-directional straight valve, lockshield valve, 10/15 mm fittings and Allen key for fixing sensor.